Every year, tax season and its accompanying meeting with my C.P.A. drives me back to the U.S. from Mexico, where I’ve been living a large part of the year since 2014. Coming back is always a shock, un choque. More than once, expats have said to me that in a lot of ways, living in Mexico is what living in the U.S. was like 20 years ago. I’m only beginning to understand what they mean. Partly it’s related to a simplicity that feels more like the U.S. in the 50’s; fewer regulations, closer families and less emphasis on technology. It's also related to the feeling you get when you're out enjoying one of its plazas or anywhere where there are lots of people. There is a feeling of Mexico’s emerging middle class as America's middle-class continues to erode. The middle class in Mexico now makes up 47% of its population and by all accounts is growing. Making a comparison on the definition of what middle-class is between the two countries is admittedly apples and oranges. The poor in Mexico are really poor. The inequality between the ultra rich and poor in Mexico is the highest among its Latin peers. The definition of what makes a Mexican middle class even varies by region. However, you feel the growing power of it when you live here, a vibrancy, an optimism on the streets. The middle class in America makes up 50% of the population now compared to 61% in 1971 and by all accounts is shrinking. If we used former traditional benchmarks; owning a home, having a car, healthcare and access to education for your children, to live a middle-class life in today’s dollars would average $120,000. In contrast, keeping the same criteria, Mexico continues to grow its middle class without increasing the cost of living. I’m the perfect age to be able to make comparisons between the quality of life for a "middle class" person today vs. 35 years ago. The beginning of my professional work-life almost exactly coincides with the period in which America’s middle class started its economic descent, in the early eighties, when wages began to lose ground against the cost of living. As a recruiter in San Diego 1982, my $45,000 in yearly commissions gave me a nice life; a shared house near the beach, a car, ski vacations, a party tab and enough leftover to put a little into a 401(k). Three years ago, I checked into an agency very similar to the one I used to work in. Upon noticing my interviewer’s safety-pinned skirt, I looked around and saw how poorly-dressed they all were compared to the stilettos and suits we wore in the same job 30 years ago (albeit theirs is a more technical job today). It occurred to me that these recruiters were probably not making much more than I did in 1982. This excellent article by Politico outlines how "contingent" work, commonly call “gig work” that breaks the traditional social contract of a guaranteed minimum wage, healthcare, workplace safety other protections makes more and more of the workforce. Fifty-seven million, or about 36% of the workforce are in the gig economy. We all read the article that went viral about Uber’s recruiting campaign. The ad featured an employee who worked right up until giving birth. They lauded her as representing their corporate culture of entrepreneurism, blind to what it said about the the ethics of not providing health insurance or maternity benefits. In a similar vein, while pursuing the Freelancer website for writing opportunities, I came across one of their recruitment ads featuring a testimony by an employee. After hours of churning out copy for a penny a word, the employee enthused how great it was to have the freedom to get up from her desk and put her laundry in the washing machine or feed her baby. Such is the freedom of the gig economy. The fact that middle class-on-down Americans are not rioting in the streets over health care, affordable education for their (future) children and a living wage that other developed countries take for granted makes me feel so angry and sad that I can’t wait to leave when I'm in the U.S. The growing inequality hurts too much to watch. In Spanish, there is a phase, “Dame pan y dime tonto” which translates, give me bread and tell me a joke.” One has to wonder if social media and exceptionally high quality of entertainment today is what “bread and circuses” were to Roman emperors. When “staying at home is the new going out,” according to the New York Times, all the events that brought community together to advocate for change don't exist to the same degree. With a click, I can send letters and make calls to my Colorado Congressmen, even from Mexico. Will these electronic and social media campaigns make the difference that unions, strikes and civil disobedience made generations ago? When someone makes a billion dollars for a product as easy to dismiss as Reddit, we clearly have a big problem. Yet too many younger people seem willing to safety-pin their skirts (or blazers) and rationalize to themselves that money isn’t that important, or they convince themselves they have a middle-class live because they can purchase services like Blue Apron (rather than buy a home). The middle class economic house is burning down and when I'm home all I can do is watch. I can’t stand it. Call me in Mexico if there is a much-needed revolution. To get an ever better feel for what the gig economy is doing to America's middle-class, I recommend another excellent article by the New York Times. A Washington Post writer tells us what every other industrialized country pays for universal healthcare coverage vs. projections of what the U.S. will pay without it. Azcentral (Part of U.S.A. Today) describes the feeling of Mexico's emerging middle class. An excellent essay I wish I would have written about why capitalism is failing and asks why we don’t resist. Next up - The best neighborhoods to live in Mexico often have a church or cathedral in the center. You might as well know a little about what you're seeing. Most recent: Over 10 million people take care of an elder family member in their homes. At an average cost of at least $114 to hire help in the U.S. Could Mexico be a better option? Recently updated: Having a house-mate when first living in a foreign country is a great idea for many reasons. Hola, My name is Kerry Baker. I am a partner with Ventanas Mexico and author of the "Interactive Guide to Learning Spanish Free Online" a curation of the best free tools on the web, with lesson plans (and my ready wit). Learning Spanish is critical to getting the most out of expat life. Use these tools to create unique lesson plans every day. 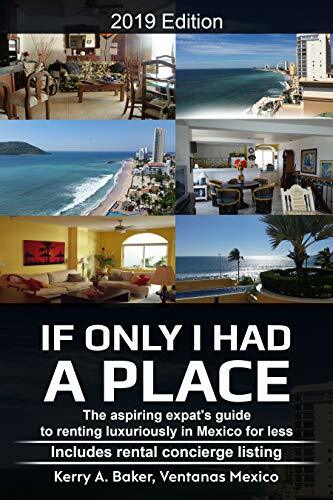 More recently I released "If Only I Had a Place" on renting luxuriously in Mexico for less. Renting in Mexico has special opportunities and dangers for the expat. Learn what realtors will not tell you, and most expats never find out to live in the most luxurous places in Mexico.